This penultimate issue of this series was not as good as the previous issue but is still pretty good. It’s a real shame this book is getting cancelled, I feel liek Tad Williams has a lot of potential with this series and he has made it fantastic in his six issue run so far. Oh well. Hopefully Tad isn’t done with comics for good after this. So the entire series ends with a cliffhanger? We finally get an answer to the new Aquaman’s origin and that’s all cool and stuff but the story isn’t really over. It ends with the new Aquaman going off to Atlantis with Topo so he can bring the old Aquaman back to life. 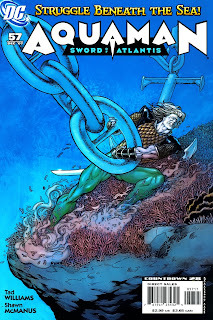 I liked the connection between the two Aquamen, the new Aquaman was dying and the old Aquaman’s essence was stolen to bring him back to life. 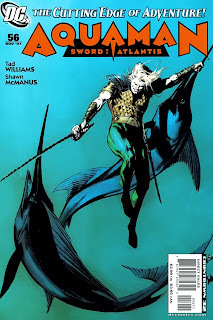 While the whole thing with the original Aquaman isn’t resolved nor is the stuff with Koryak and Tempest, Williams did the best he could to bring this series to a close in one issue and I give props to him. I really enjoyed Tad Williams’s run on this series. 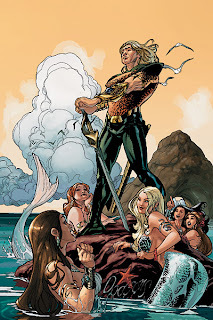 We all know a new Aquaman series will happen someday, but for now I look forward to seeing Aquaman around the DCU. Haha I liked the reference to Seinfeld on the cover of this issue. Anyways, this was another great issue. The mystery deepens even more this time around as we learn the new Aquaman’s dad believed his son dead, and even saw him die months before we first saw him in issue 40. 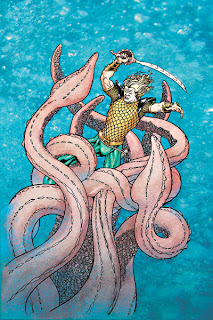 Tempest meets an interesting Jelly-fish girl, Aquaman battles the Human Flying Fish, and more Topo fun. I am sad this series is ending, it’s a lot of fun. Most people who are reading this won’t even realize that this issue solved a mystery that has been going on for like 5 years. We now know why San Diego sunk into the water and why the survivors could breathe underwater. 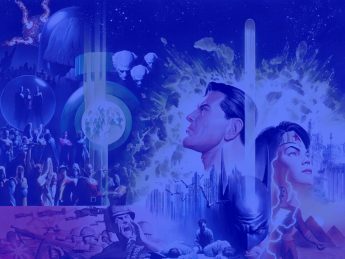 It was all part of a scary plan concocted by Vandal Savage. The whole thing being planned by Super villains totally fits this book in a way it doesn’t fit the other books. The mystery being revealed wasn’t anticlimactic at all. I hope Williams gets to do another book after this ends because he is a great writer.